Andrea has been teaching Mandarin Chinese for more than five years. In this time, she has taught both adults and children, and has particular expertise in teaching American-Chinese children. She also specializes in test preparation, including the new HSK (Chinese language proficiency in mainland China) and TOCFL (Chinese language proficiency test in Taiwan). Andrea is patient and enthusiastic, so is especially well suited to those starting their Chinese language journey. The first step in learning Chinese is finding a good teacher, and the second is choosing the right book. Andrea will rely on her experience to choose the most appropriate resources for you and help you onto a great start with learning Chinese. 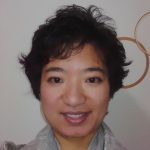 Andrea always uses vivid examples to help keep your Chinese learning fun and on course, while at the same time assisting you in conquering teething problems in your language use, including tones and grammar.